Life has a funny way of leading us down a different path, and that’s exactly what happened when Vic had to pay a visit to the vets in Wanstead, east London. Realising the area offered the same Victorian housing stock as the location she had her heart set on moving to in west London, but for a fraction of the price, she reconsidered her plans. Having undertaken a renovation project, Vic and partner Tim have transformed the property into their dream home. Find out more about their renovation project, then browse more of our inspiring real home transformations. Got plans to take on your own project? Our expert guide to renovating a house is just what you need. 'There was a real village quality to the area,’ she says. ‘I was sold on it.’ Vic first saw the house that is now her and her partner Tom’s home when their daughter was just 10 weeks old, but she initially ruled it out. With Vic now on board, the couple put in an offer for the property, which they financed using savings and the proceeds from the sale of their flat. ‘Buying a dated property meant we could start from scratch and create a space that was tailored to our needs, rather than having to live with other people’s design decisions,’ she adds. Shortly after moving in, the couple contacted architect Tom Kaneko to redesign their home, giving him a brief that included creating an open-plan kitchen, garden views and a downstairs WC.‘We love metal-framed windows, so we wanted to have them somewhere, too,’ says Vic. Architect Tom drew up several design solutions for the space, before the couple decided to go for a curved kitchen extension and a largely open-plan layout on the ground floor. As the extension met the guidelines for permitted development, the couple didn’t need planning permission. ‘We did require a Party Wall Agreement as well as a Build Over Agreement, which gave us permission to extend over a pre-existing sewer,’ explains Vic. Both approvals came through in weeks and work was soon underway. With the building work estimated to take three months, the family decided to live in the property for the duration of the project rather than taking on the extra cost of moving into rented accommodation. However, part way through the work, Vic and Tom added the renovation of the bathroom to the list, as well as replacing all the uPVC windows with double-glazed wooden sashes. ‘We realised it was better to get all the disruption over in one go,’ explains Vic. These additional items and some delays meant the project eventually took 10 months. ‘We decamped upstairs for most of the build and made do with a makeshift kitchen in the loft,’ she recalls. It might be a cliché, but the new kitchen is the heart of Vic and Tom’s redesigned home. Walking into their house today, you go through a door to the left of the hallway and you’re straight into a bright, open space leading from the front to the back of the house. Extensive views of the garden draw you through to the modern extension at the rear, which is where the family now spend most of their time. The new space is filled with natural light thanks to several rooflights and the wall of Crittall windows and doors that Vic and Tom were so keen to include in their home. To give the kitchen a unique look, the couple opted for a bespoke design rather than off-the-peg units. The CNC-cut plywood kitchen was designed by architect Tom and built by the main contractor, John McGivney, with curved details echoing the curved wall of the extension. ‘Over the years I’ve learned a great deal from my colleagues about what makes a good kitchen,’ she says. One such solution is the cleverly designed folding leaf that extends the size of the island. ‘When we have people over, we tend to gravitate towards the island and have a drink there before we sit down for dinner,’ she says. 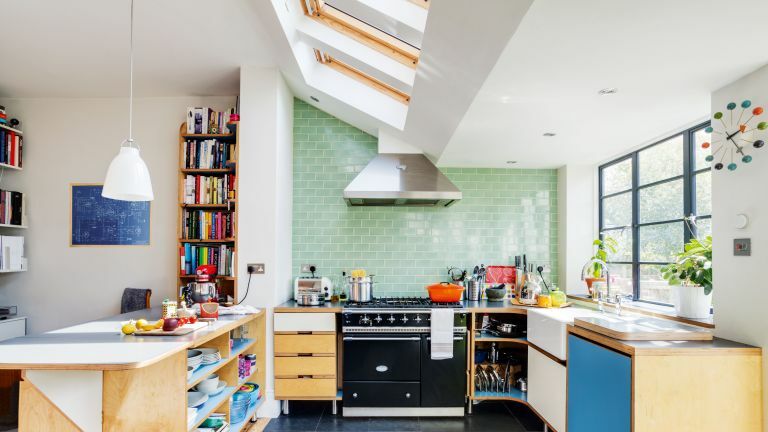 ‘The space really works for us as a family, too – we’re always cooking, eating or doing homework in here.’ In addition to the main building work, the couple also reconfigured the rest of the space, allowing them to find room for a downstairs bathroom and spacious larder. Upstairs, there are two bedrooms, a family bathroom and a colourful home office. Blocking off a connecting door between the master bedroom and office has created a more practical layout, and fitting a sliding door to the family bathroom has maximised the available space. Painted walls and whitewashed floorboards provide a neutral backdrop for the family’s colourful furniture and accessories. Want to take a look at more real home transformations?